It seems to me like this recipe is more popular in the midwest as I don’t see it very much down here in the South. In fact, the memory of these bars had been tucked deep into my brain until a friend brought them to a girls’ weekend in the mountains. As soon as I took my first bite, I was instantly a giddy 8 year old kid on Christmas Eve again. I asked her for the recipe so I would never lose my ties to this nostalgic treat…and so I could start making them a holiday tradition as a mama with my own family. Don’t be fooled. Just because there is low-calorie cereal in the base of the bars, they are by no means, “healthy.” Once you combine the cereal with Karo syrup, sugar and peanut butter, you’ve taken a swan dive off the healthy train. Embrace it. Because the next thing you’re going to do is top the bars with a mixture of chocolate chips, butterscotch chips, and a little more peanut butter. Let’s pause for a moment of silence. Boil the sugar and corn syrup together over medium-high heat. Turn down the heat and add the 1 c. of peanut butter and the Special K cereal. Stir until thoroughly coated. 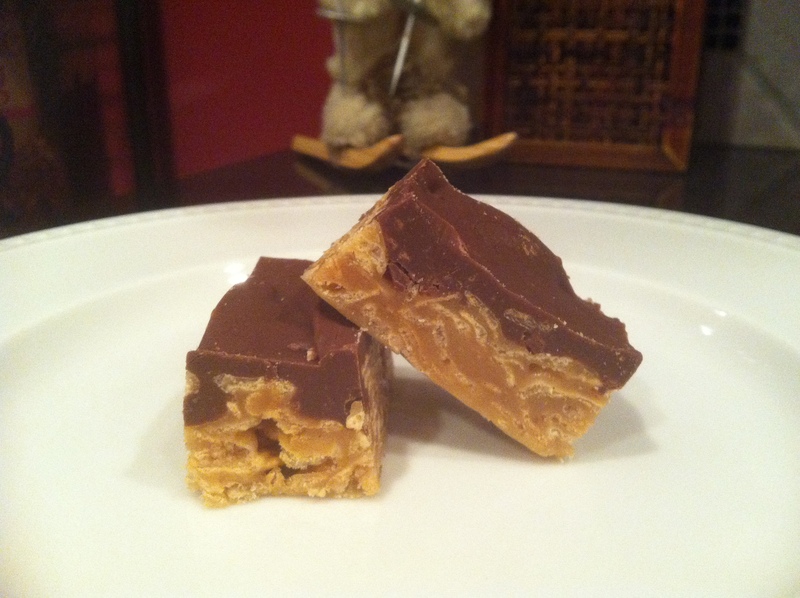 Melt the chocolate and butterscotch chips along with the 1 Tbsp. peanut butter. You can do this on the stovetop or in the microwave. If you use the microwave, heat the chocolate in 30 second intervals, stirring in between, to ensure you don’t burn the mixture. Spread the chocolate mixture on top of the bars. Allow to cool (you can use the fridge if you want to speed the process) and cut into bars.